Description: An all purpose brush for blush or bronzer application, the brush has a ful.. Description: Eyebrow brush that's a must! This eyebrow brush is specially designed to expertl.. Description Use this angled brush to add shading on the nose, and define the cheek contour for .. Description Use this tapered brush to flush colour on the apple of the cheeks for a naturally h.. Description: This brush is specifically designed for advanced makeup application to help achi.. Description: Perfect for separating eyelashes before and/or after mascara application .. Description: Specially sheered brush tip absorbs the perfect amount of eye shadow and provide.. Description: Keep brows perfectly shaped. The comb side smooths brows for a polished, neat lo.. Description A firm tip eye liner brush draws the finest line. .. Description Use this flat and round-edged brush to apply and layer up colours on eyelids to sha.. 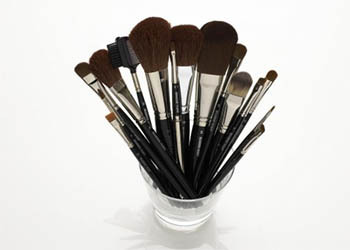 Description Use this large, flat and round-edged brush to apply and layer up colours on eyelids..